Sad news reached me last week as I learned of the passing of Dimitri Nieuwenhuizen, one of the partners of the design studio LUST together with Jeroen Barendse and Thomas Castro. This studio, located at a crossroads between graphic design and new media, closed its doors in September of this year, but will receive the prestigious Piet Zwart Award for their oeuvre tomorrow (the 28th of October). The prize is significant, not only because it adds LUST to a list containing some impressive names (such as Wim Crouwel and Gert Dumbar), but in particular because it tells us something about the changing role of the designer in the 21st century. This theme resonated in LUST’s work as a studio as well as in Dimitri’s teachings, who was one of my professors when I studied graphic design at the art school HKU in Utrecht. The Piet Zwart Award is granted by the BNO, the Association of Dutch Designers, and forms “an honorable distinction for an excellent designer/design team with great significance for the field and that presents a role model for the next generation(s) of designers”. It is quite a mouthful, but the message is clear: the jury recognizes LUST as indicative of what graphic design is about at present and should be about in the future. As the jury report underlines: “LUST has pushed technological boundaries, has continually been at the forefront of finding applications for new technology and has demonstrated that programming can constitute an essential part of a design solution”. In short, where earlier examples such as Crouwel and Dumbar may summon more classical images of graphic design as consisting of printed matter, LUST embraced the potential of digital technologies a new direction for creative practice. 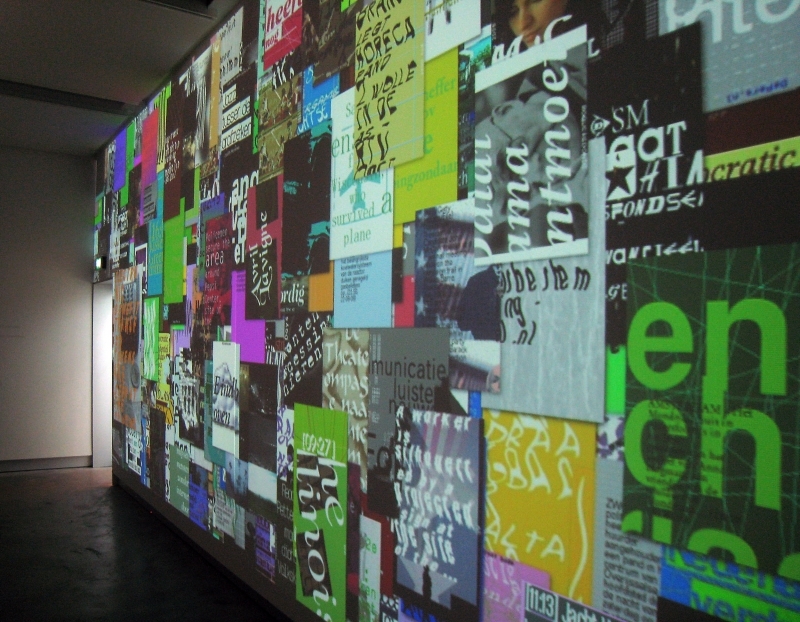 This is evident in their project Posterwall for the 21st century, an interactive installation realized for the Graphic Design Museum Breda’s reopening in 2008. Dimitri brought us – his students – to visit the exhibition, which tells a chronological story of graphic design in the Netherlands. In the exhibition’s final room, the story culminated in Posterwall, an interactive digital installation of about six meters wide and three meters high. Posterwall was driven by an algorithm that would continually and autonomously generate new posters from digitally available content, projecting the results on the far wall of the room. The plaque accompanying the piece announced that the installation was to question if graphic designers were going to exist in the future at all, since an algorithm could generate hundreds of posters per day without any human intervention. If the future of graphic design was a topical theme then, almost a decade later the issue is even more urgent. On the one hand we have Blade Runner-esque predictions about the immanent and far-reaching automatization of human labor, and on the other, claims that a quality like creativity could never be replaced by computers. Of course, the answer to the question posed by Posterwall ultimately depends on what one means by the term “graphic design”, and how this fits into a broader understanding of creative practice. If design is solely about finding suitable visual form for information, then the answer to the question is likely to be “no”: those designers could perhaps easily be replaced by machines. But if design is about ideation and creative exploration, then at least for LUST the answer would be a resounding “yes”: graphic designers continue to be necessary. We can find evidence for this in the direction that the studio took after Posterwall 1.0: new iterations of the installation traveled to exhibitions in the United States and South-Korea, and in 2010 the partners founded an experimental branch called LUSTlab, directed at free exploration of digital technologies. By making use of computer programming for visual art and design, a practice more commonly known as “creative coding”, the digital was not a threat to their work as creative professionals, but their partner in exploring new forms of design work. In doing so, they even unearthed new continuities between “classical” designs and their digital work. A good example is the installation Type/Dynamics, which both literally and figuratively formed an extension to the lively typography of 20th century designer Jurriaan Schrofer. The continuities and differences between pre- and post-digital creative practice in graphic design are as relevant a topic now as ever. In my view, it is paramount both for the field of arts and culture studies, but also – and especially – for the new generation of designers that is being trained within this still rapidly evolving context. What role will they play in this world of semi-autonomous systems, and what skills will they need to fulfill it? Even if Dimitri has passed away, and LUST has disbanded, their question turns out to be a generative one, propagating beyond its original locus. The future of design may seem uncertain, but good ideas are like open-source software: they spread and migrate, adapt and evolve, continuing their influence further – and further still.